The place of crucifixion was near a garden, where there was a new tomb, never used before. 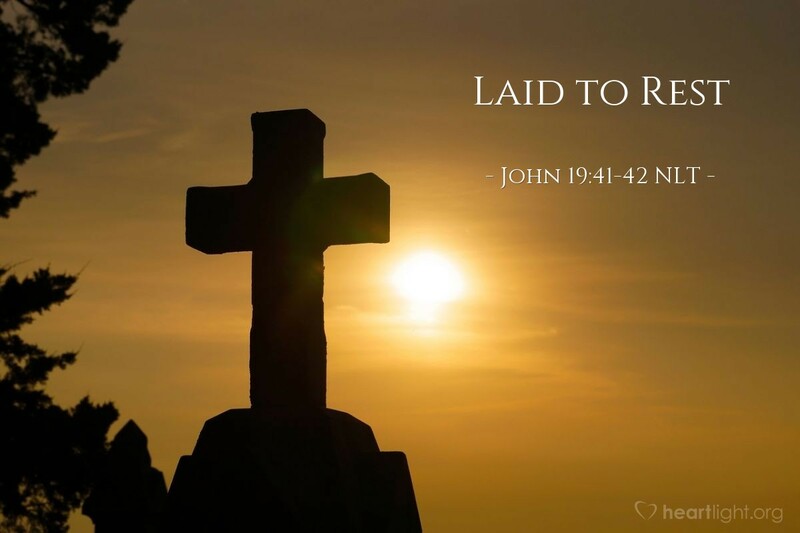 And so, because it was the day of preparation for the Jewish Passover and since the tomb was close at hand, [Joseph and Nicodemus] laid Jesus there. There are few things harder than leaving the bodies of loved ones at their graves. Walking away leaves such a sense of finality and loss. Can you imagine the heartbreak of Joseph and Nicodemus as they left Jesus' body at this place of the dead? How many shattered dreams and hopes did they place in that tomb with the one they hoped was Israel's Savior? Gather it into your heart: Jesus died and was placed in a tomb! Jesus, who was God come in human flesh, was claimed by the mortality that will claim each of us. What unbelievable love for God to share our mortal plight in such a personal way! Thank you, dear God, that you would have Jesus actually die for my sins. The very thought of this boggles my mind and fills my heart with wonder and appreciation. In Jesus' name. Amen.